Some dads have a dashing sense of style. They know the power of a great suit, and the secret to personal style. So when it comes to Father’s Day shopping, save yourself the trouble and give dear ol’ pops something that is classy and iconic as he is. The perfect tie! With over 5,000 colors and styles to choose from, Bows-N-Ties has a fantastic selection of ties, bow-ties, and more - making it easy to find dad’s favorite pattern or hue. The other day, I picked out two neckties for my husband, and he absolutely loved them! 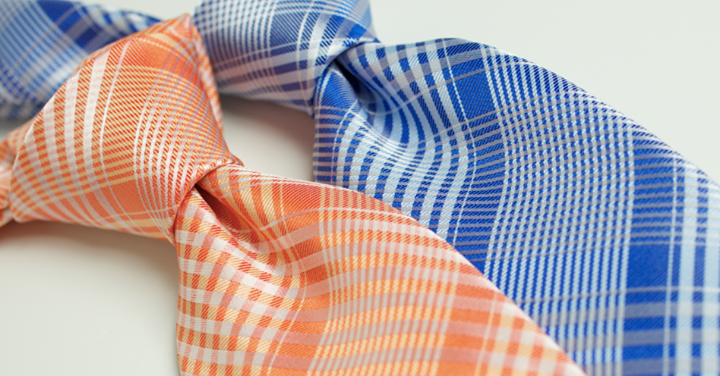 The tangerine-orange necktie I picked is a bold burst of color, and the perfect choice for summer! It’s classy and elegant without being too serious. The navy blue necktie is a modern rendition of a plaid tie, and ideal for his business attire. It’s interesting and cool while still remaining classically chic. I can’t say enough good things about the quality or pricing either. It’s beyond! Make sure to check them out, and read my previous post here when you get a chance. Trust me, you won’t be disappointed. Now it’s your turn to treat dad, (or any special man in your life), with an awesome tie too! Bows-N-Ties is graciously giving one of my readers a necktie of their choice! To enter simply follow the instructions on the rafflecopter widget below. I would give the classic stripe tie to my husband. I would love to win one for myself! I would get one of the new mint ties. I love the Modern Striped Tie in Light Yellow, Baby Blue, and Navy. I love the Repp-Stripe Tie in Charcoal and Gold my hubby will love it. Visited and I really like Large Scale Plaid in Charcoal and Burgundy tie for my Husband. I would choose the striped tie in blue and white for a special friend.